Welcome to DunwoodyTshirts.com! We provide branded promotional items and imprinted sportswear to the movie industry, film production crews, corporations and small businesses, nonprofits, and individuals. We are your one-stop shop for it all! Don’t have a logo or design yet? Let us create you a one-of-a-kind logo and brand that speaks all about your quality, beliefs, and vision. Proudly supporting local sports programs, schools, and organizations, we also provide branded t-shirts for most of the local schools and programs in the area. Why not give us a try and see for yourself our world-class customer service and products. Let’s get started on your next promotion! 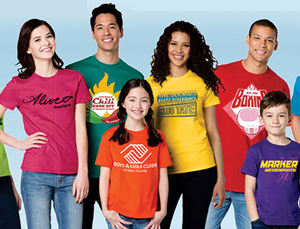 JULY SPECIAL: 100 T-shirts for only $595. Use promotional code JULY18 when you contact us.